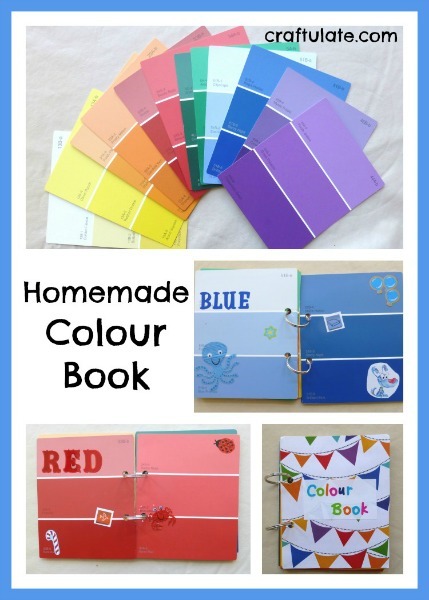 This colour book is a wonderful way for toddlers to learn their colours! 2 metal rings -I used these split rings, but I’ve since seen these coloured book rings which look so pretty! Note: I happened to have these paint swatches already but if you are planning to make this book then please ask your DIY store first before taking the swatches, or you could even ask if they have any out of date swatches you could have. I used two swatches for each colour, and glued them back to back to form a book layout. I decided on this style rather than flash card style (with the same colour on the front and back of one card). Then I found some patterned paper to make a front and back “cover”. ge with colour themed stickers and letters. F seemed to really enjoy the format – it wasn’t just a regular book and it contained bright but simple images and colours that appealed. 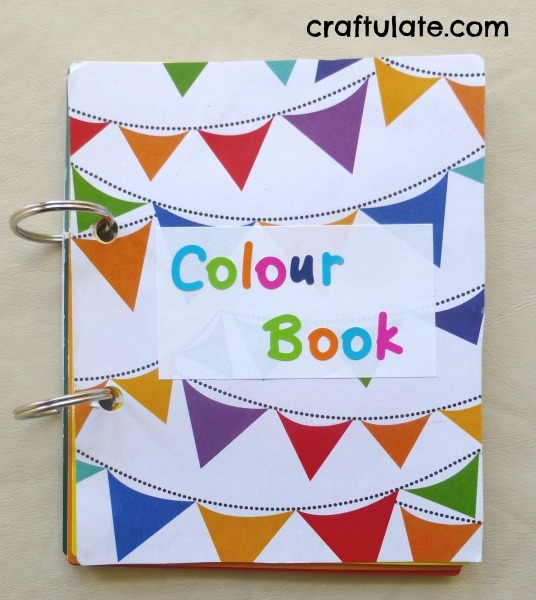 It would be easy to customise and personalise this book, perhaps with the child’s name on the front or themed stickers. What a brilliant idea. Even if you have to collect the swatches specially! It also shows him that there is more than one colour blue, for instance. Easy, educational and genius, I’d say! Thank you for comment in my blog. I love your blog and there are a lotof great idea I can do with my 2.5 year old son. I also updated printable Thomas paper craft. Feel free to download if you like. Thanks – checking it out now! Love this. Thanks for sharing. 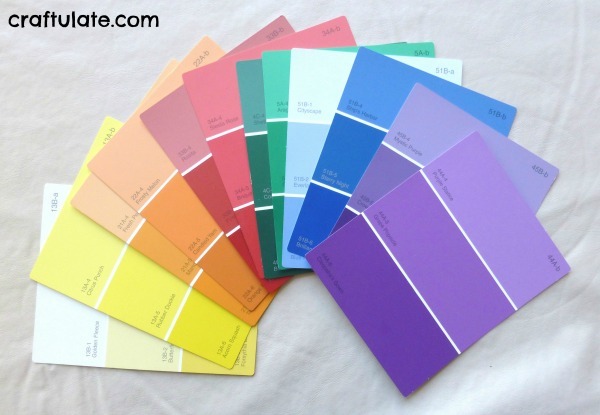 We’ve used paint swatches for many activities, but had not thought of making a color book. What a smart idea! This is really great and so easy to make. Thank you so much for sharing on We Made That! So simple! 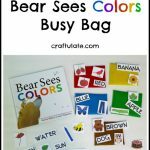 I love that it allows your child to match and add stickers of the same colors too! Thanks so much for sharing at For the Kids Friday over at Sun Scholars! Always happy to see new people have found us! I am featuring YOU this week! Stop by and grab a featured button! Hope to have you back to share again! I love this idea! I have seen people use paint chips for color projects before, but I think this is the best one for toddlers and preschoolers I have seen. I will have to pin it for the next time we work on colors. what a cute idea! i will remember this for sure! thanks for sharing! Love this!! What a cute, meaningful idea for a color book. I really like how you used the paint chips because it shows the different shades of each color. Thanks for linking up with Stress-Free Sunday! Thanks Anna! I’m so glad that so many people like this idea! Fab idea. Can you buy adhesive magnetic squares – might be fun to have magnetic colours to ‘match’ incase the stickers don’t come off. Very inventive and genius idea. I like your thinking! You can get rolls of magnetic tape which would do the job perfectly. So cute. I would deffinatly laminate them to last longer and make more durable..
Great color book idea, love it! This is a great idea. My little one would love it because she is very into colors right now. Adorable! I have got to make one for my little guy! This is so awesome. Shared on Laughing Kids Learn FB page. What a wonderful idea!! Going to make some for my grandchildren…already have the swatches. Great way to use up some of my scrapbook supplies!! Love this idea. I pinned it to my Toddler Ideas pinterest board. I can see why this has been so popular! It’s perfect for the little ones, in fact, I’m going to make one right now! This is such a great idea! I’m definitely going to do this for my toddler. He’s very much into colors these days. What a great idea, Nicola!